The human immunodeficiency virus type 1 (HIV-1) encodes several proteins that enhance infectivity. Among these auxiliary proteins there is the Virion infectivity factor (Vif), that is a small, highly basic protein encoded by all lentiviruses except equine infectious anemia virus. Such ubiquity implies an important function in viral replication. However, vif sequences are highly divergent, and sequence analysis did not reveal any known protein structural motif. Consistently, no cellular homolog of Vif has been identified. Supposing that vif functions are conserved among lentiviruses and keeping in mind that the Vif structure remains to be experimentally determined, one can find it intriguing that Vif protein folding might be conserved despite massive amino acid variations. However, multiple alignments of lentiviral Vif proteins highlighted invariant residues located mainly in the central region of the sequence. This region contains a noncanonical zinc-coordinating structure and a short peptide (S/T-L-Q-Y/R-L-A consensus) conserved in all lentiviral orthologs (Fig. 1). Zinc binding to the HCCH motif induces a conformational change that induces Vif multimerization and aggregation, whereas zinc chelation inhibits HIV-1 activity and liberates the antiviral function of the restriction factor expressed in nonpermissive cells. Fig. 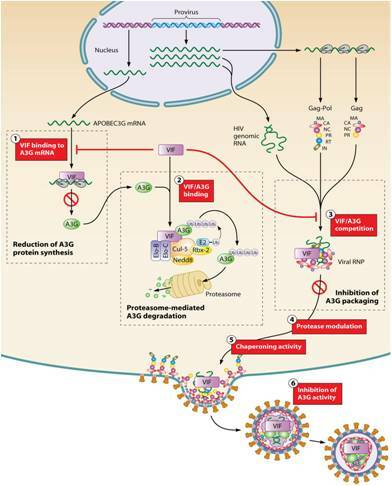 1) Schematic representation of HIV-1 Vif domains required for interactions with viral and cellular molecules. The N-terminal region of Vif is green, the central zinc binding domain is orange, and the C-terminal region is red, turquoise, and Matisse blue. Fig. 2) Multiple antiviral mechanisms of virion-incorporated and endogenous hA3G. In the absence of Vif, hA3G is efficiently incorporated into budding viruses. After liberation of the viral capsid into a new (nonpermissive) target cell, hA3G impedes reverse transcription and integration in a deaminase-independent antiviral action, probably through its RNA-binding properties. Once reverse transcription has started, hA3G mediates the extensive deamination of dC to dU during minus-strand DNA synthesis. This enzymatic reaction blocks HIV-1 replication due to (i) the accumulation of dG-to-dA hypermutations in the synthesized plus-stranded viral DNA (giving rise to aberrant proteins) and (ii) the degradation of viral DNA, because the U-rich DNA can be recognized by the cellular repair machinery (uracil DNA glycosylase and apurinic-apyrimidic endonuclease). Endogenous h3AG also functions as a potent restriction factor for HIV-1 in resting CD4+ T cells. hA3G exist as HMM and LMM complexes. Only the LMM complexes function as a postentry restriction factor by blocking the accumulation of reverse transcripts of incoming viruses. HMM complexes impair the transposition of Alu elements by sequestering Alu RNA transcripts away from the nuclear transposition machiner. The identification of hA3G as the restriction factor counteracted by Vif was soon followed by the characterization of another member of the APOBEC protein family with anti-HIV activity, hA3F, which is extensively coexpressed with hA3G in nonpermissive cells. hA3G and hA3F are considered to be the main restriction factors neutralized by Vif, even though hA3F is less potent than hA3G. Vif decreases the intracellular concentration of hA3G and hA3F: HIV-1 Vif dramatically reduces the packaging of hA3G into virions, and conversely, biologically inactive Vif mutants are unable to prevent hA3G incorporation. Vif reduces the steadystate level of hA3G, and numerous studies showed an important decrease in the hA3G half-life in the presence of Vif. Accordingly, several groups showed that HIV-1 Vif suppresses hA3G antiviral function by hijacking the cellular Cullin5 (Cul5)-ElonginB (EloB)-ElonginC (EloC) E3 ubiquitin ligase to induce the degradation of hA3G and hA3F by the proteasome (Fig. 3, step 2). Vif was indeed shown to bridge hA3G with a cellular E3 ligase. First, the C-terminal region of Vif possesses a 144SLQ(Y/F)LA155 motif that binds to EloC (Fig. 1). This motif is similar to a conserved sequence found in the BC box of the suppressors of cytokine signaling (SOCS) protein. Second, a novel zinc-binding motif in Vif with the consensus sequence 108Hx2YFxCFx4×2Ax7-8Cx5H133 binds to Cul5, the core subunit of a Cul5-based E3 ligase. (Fig. 1). Finally, via these two domains, Vif recruits an active E3 ubiquitin ligase complex composed of EloC, EloB, Cul5, Nedd8, and Rbx2 that induces the polyubiquitylation of hA3G and hA3F and subsequently directs them to the 26S proteasome for degradation (Fig. 3). Fig. 3) Schematic representation of Vif and hA3G functions in HIV-1 assembly and replication. During viral particle production, Vif is found in the cytoplasm of infected cells and is encapsidated in small amounts into virions. Vif neutralizes hA3G and hA3F in virus-producing cells by different mechanisms. (1) Vif has been shown to impair the translation of hA3G mRNA, probably through an mRNA-binding mechanism. (2) Vif binding to hA3G protein recruits an E3 ubiquitin ligase that mediates the polyubiquitylation of hA3G and its degradation. (3) Vif competes with hA3G for binding to viral components like the nucleocapsid domain of Gag and/or viral genomic RNA. Taken together, these three different actions of Vif on translation, degradation, and packaging not only deplete hA3G from virus-producing cells but also prevent. hA3G from being incorporated in virions. (4 and 5) Intracellular Vif may also influence viral assembly through the modulation of viral protease-mediated cleavage of Gag precursors (4) and its chaperoning activities (5), thus allowing late events such as precursor maturation, initiation of reverse transcription, and RNA dimer maturation to occur after viral budding. (6) Finally, Vif might be able to directly inhibit the activity of the few hA3G molecules that are packaged in WT virions. RNA-binding properties of Vif are essential to HIV-1 replication in nonpermissive cells, and the fact that Vif is associated exclusively with unspliced genomic RNA is a strong indication that the interaction of Vif with viral RNA is crucial for its function. It is still unknown whether Vif binding to RNA might play a role in the degradation of hA3G and hA3F. However, both proteins are part of a common RNP localized in the processing bodies and/or stress granules of infected cells. Indeed, several analyses have indicated that hA3G is associated mainly with mRNAs (including hA3G and HIV-1 gag mRNAs) that shuttle between translationally active polyribosomes, mRNA-processing bodies, dormant stress granules, and Staufen granules. Interestingly, Vif localizes in processing bodies only in the presence of hA3G and hA3F, suggesting that Vif is recruited to processing bodies due to its interactions with these proteins. Regarding Vif functions, it is possible that the recruitment of hA3G and hA3F takes place in the processing bodies prior to proteasomal degradation. On the other hand, during viral infection, the vast majority of mRNAs and proteins present in RNPs are not found in viral particles, suggesting that competition operates within these various RNA granules with viral genomic RNA and that HIV-1 RNA and APOBEC protein trafficking converge to these compartments. Interestingly, hA3G has been detected in high-molecular-mass(HMM) (5-to 15-MDa) ribonucleic complexes in the cytoplasm of H9 T-cell lines and activated T cells (Fig. 2). In these complexes, the deaminase activity of hA3G has been shown to be inactivated. Deaminase activity can be artificially restored by treating HMM complexes with ribonuclease A, thus converting the HMM complexes to low-molecular-mass (LMM) complexes, suggesting that RNA plays an important role in HMM complexes assembly. Additionally, HMM complexes have been shown to protect against Alu retrotransposition by sequestering Alu RNA away from its replication machinery (Fig. 2). On the other hand, hA3G proteins present in LMM complexes have been shown to function as a potent postentry restriction factor that inhibits the replication of incoming viruses (Fig. 2), explaining why resting T cells that contain mainly LMM complexes are resistant to HIV-1 infection. Conversely, the activation of resting T cells converts hA3G-containing LMM complexes into inactivated HMM complexes. Degradation is not the only mechanism leading to a reduction of the intracellular hA3G concentration. Mariani and coworkers reported a 4.6-fold reduction in levels of hA3G synthesis in the presence of Vif, and Vif has been shown to inhibit the translation of hA3G mRNA. Vif also prevents incorporation of hA3G in HIV-1 particles. Mutations of conserved phosphorylation sites in Vif that impair viral replication do not affect hA3G degradation, indicating that Vif has another function(s). 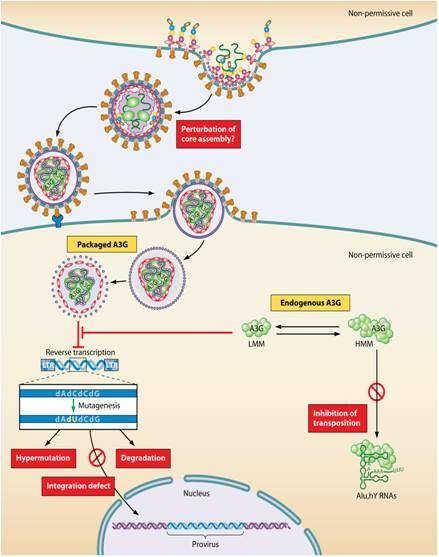 Accordingly, HIV-1 Vif is able to inhibit the packaging and antiviral activity of a degradation-resistant hA3G variant. Furthermore, several studies suggested that Vif prevents the packaging of hA3G into HIV-1 independently of the reduction of its intracellular concentration (Fig. 3, step 3). By cotransfecting WT or Vif-deficient HIV-1 and various amounts of hA3G-expressing vector, it is possible to compare WT and Vif-deficient virions produced from cells with similar hA3G levels. Under these conditions, WT virions incorporated less hA3G than Vif-deficient virions, suggesting that Vif can directly exclude hA3G from virions. Another mechanisms involves the evidence that Vif inhibits the activity of intravirion hA3G. Finally, significant amounts of A3G were detected in virions produced in 293T cells transiently expressing WT HIV-1 and A3G, showing that under certain conditions, Vif does not lead to the complete depletion of A3G from viral cores. In every case, virion infectivity was restored, suggesting that Vif functions both in the cytoplasm to prevent the encapsidation of bulk A3G and in the virion to counteract core-associated A3G (Fig. 3). This idea is corroborated by a study showing that the production of infectious Vif does not require a depletion of hA3G from virus-producing cells. Vif associated with viral nucleic acids during reverse transcription could inhibit the cytidine deamination of nascent proviral DNA by hA3G. Indeed, Santa-Marta and coworkers showed that hA3G-mediated hypermutation in Escherichia coli was inhibited by Vif. The fact that the ubiquitin-proteasome system is absent in bacterial cells and the fact that inhibition by Vif was correlated with binding to hA3G strongly argue in favor of a direct effect of Vif on hA3G enzymatic activity, which could involve the masking of nucleic acid substrates that are tightly associated with Vif (Fig. 3, step 6). Indeed, an important fraction of the Vif-binding sites that were identified in the 5' region of HIV-1 genomic RNA correspond to hypermutated sites in Vif-deficient viruses, and Vif also binds with significant affinity (Kd[dissociation constant] of 34 to 38 nM) to the consensus hA3G and hA3F DNA target sites. Thus, Vif could interfere with hA3G by limiting its access to the neosynthesized viral DNA. Alternatively, it might locally limit the RNase H activity of HIV-1 reverse transcriptase that is necessary to restore the deaminase activity of hA3G, which is otherwise inhibited upon binding to HIV-1 genomic RNA.